This statue of the Buddha is one of the prominent sites in the Capital city of Thimphu, and boasts of being the World’s Tallest sitting Buddha at a staggering height of 200.6 Feet. The whole statue is made of Bronze and gilded gold. There are thousands of smaller Buddha statues within this Big Buddha statue. The Buddha’s body frame houses a temple within and the throne houses a spacious meditation hall. The entire Buddha is of 4 stories in height and each story holds its own significance. 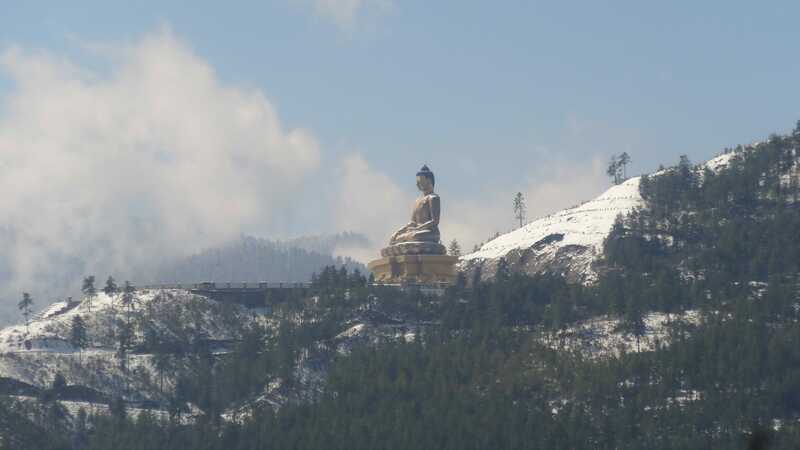 This statue is perched on a hill overlooking the Thimphu Valley and there is a Nature Park there named Kuenselphodrang. This Buddha statue was build fulfilling the prophesy of the Guru Rimpoche or Guru Padasambhava, in the 8th century and this prophesy was discovered in a hidden treasure form by the ancient great treasure hunter Terton Pema Lingpa. Presently this Buddha Dordenma or the Vajra Throne Buddha site is quite popular with the Bhutanese and the tourists alike,as when one enters the Thimphu Valley, this statue is very prominent and intimidating thus almost all visitors to Thimphu make a trip to this beautiful site.